I am fairly new to the blogger world and I have to admit, it’s a little harder than I thought. 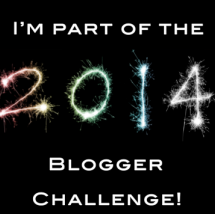 I saw a fellow blogger post about the 2014 Blogger Challenge and thought it would be an amazing idea! Gaby will send out two topics a month to each blogger who signs up and we then write about those topics. I think it will be a great way to meet other bloggers and be apart of something good for the upcoming year. Go to Gaby’s Page and sign up with your name and your email! Have fun! This entry was posted in Fellow Blogs, Uncategorized and tagged 2014 Blogger Challenge, bblogger, blog, Challenge, tag on November 14, 2013 by Monica. Just joined in! Can’t wait to find out our topics!